The year was 2010. Jay Electronica had just signed to Roc Nation, there were promises of a debut studio album on the way, and the hip-hop world was at a fever pitch. It was the most highly anticipated album of its time, but nearly a decade has passed with no release. Under the same circumstances, a lesser artist would have faded into obscurity by now. 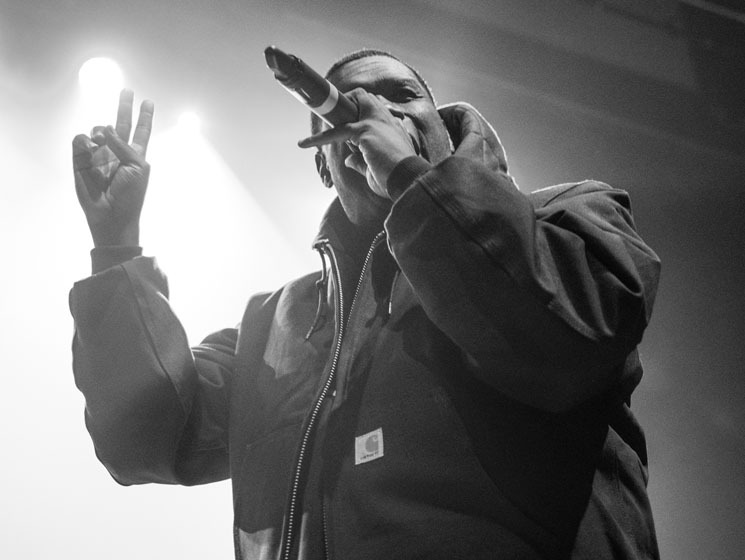 But Jay Electronica's magnetic energy and raw talent were enough to pack Danforth Music Hall with an enthusiastic crowd, disappointments about the "Album That Never Was" set aside for one night. New Orleans trio MadeGroceries and Toronto favourite Sean Leon shared the task of kicking off the show. Opening isn't easy, but MadeGroceries held their own, never letting their energy waver throughout their set, despite a thin crowd of early arrivals. With no hype man, no theatrics or frills, Sean Leon commanded the stage like a pro. His set was disappointingly brief, but he was right at home in front of the warming crowd. He got the audience especially riled up with live renditions of "Turf" and "The Rate Race," dedicated fans in the front row recited every word. The adage that Toronto doesn't support their own is a myth. After some waiting, Jay Electronica opened his set with the "Dear Moleskine." It's a sombre song to open with, but Jay was all smiles as he spit the opening bars, his gold grills glistening as he rapped about loneliness and depression. The lyrics were sorrowful, but the crowd was jubilant as they recited his words, hands over hearts and smiles on faces. Love coloured the air. Part preacher, part poet and part comedian, Jay Elect proved himself to be an expert showman. A true man of the people, he spent much of his time right in the middle of the crowd, performing songs like "Exhibit A" and "Dimethyltriptamine" from the floor. "I hate the space between us," he said referring to the gap between the stage and the audience. Literally and figuratively, the whole night was about closing gaps — he graciously shared his stage (and his Henny) with diehard fans throughout the show and took many opportunities to hop the security gate and interact directly with his enthusiastic audience. He marvelled at the diversity of the crowd, radiating with heartfelt gratitude. "Look at the beautiful views tonight! I appreciate y'all," he said sincerely. "I don't take any of this for granted." A humble and generous host, Jay even called for a homegrown talent to get on stage and showcase their skill. Toronto rapper DijahSB was the lucky artist he chose, the first woman he's had the opportunity to feature in this segment of his set. She delighted the crowd with her impromptu performance and it was endearing to see Jay Elect's eyes light up like a child on Christmas as she momentarily took over his spotlight. He performed all of the songs that have captured our hearts over the years: "Shiny Suit Theory," "The Announcement," "Better In Tune With The Infinite" — the advantage of having a small catalogue is that no classic is overlooked. But the most heartwarming performance of the night was "Eternal Sunshine (The Pledge)." For this number, Jay Elect invited as many fans as the stage could fit to join him in reciting the ingenious opus that started it all. It was a beautiful sight. It came as no surprise that Electronica saved "Exhibit C" for his exhilarating closer. He hopped off stage again for this one and stood in the middle of the frenzied audience, who became a choir as they belted the song's sample, Billy Stewart's "Cross My Heart," with wild anticipation. Even after so many years, "Exhibit C" still has the power to make an audience erupt. It was a perfect finish. Album or not, Jay Electronica has an undeniable gift and his live show is a reminder. He isn't flashy and spends most of his time cloaked in the shadows, but there's an indisputable magic about him that is a pleasure to witness in person. Even if the album never comes, his live show will always be worth braving the cold.